I was so caught up in the Roy Halladay Jamie Moyer costume that I missed this one: Ryan Howard and Jimmy Rollins attended the 80s party, too, and were well-prepared. Here, posing with Brandy Halladay are the Phillies' shortstop and first baseman as Run DMC. AND - as Nick Petrucci points out on Facebook - that is BEN FRANCISCO in the background. Francisco has played for four teams since he left the Phillies, including 21 games for the New York Yankees last season. I am not sure the nature of the party just yet, but it's nice to see the camaraderie among teammates. There is no truth to the rumor that Michael Martinez attended as a Rubik's Cube. Everyone loves a good 1980's party. Former Phillies pitcher Roy Halladay appears to be making good use of his retirement by attending such parties. In doing so, he dressed up as one of our favorite former Phillies who played in the majors in the 80s. No, not Von Hayes, but Jamie Moyer. I definitely think that Halladay deserves a spot among the top 1980s-inspired halloween costumes. Props to Brandy Halladay, too, for her slap bracelets. UPDATE: Ryan Howard and Jimmy Rollins also attended...and dressed as a well-known duo. He should be good, right? Photo by Richard Wilkins Jr. So we're at the end of 2013, mercifully for Phillies fans. We had to put up with a second straight dud of a team, and now a nearly universally panned off-season. In a little over a month, some players will start showing up in Clearwater, and baseball will be at hand. So the question is, who's going to be there. Now that doesn't quite scare you like the 2011 rotation, does it? With that said, if they stay healthy, it's reasonable to believe they could be above average, particularly if Gonzalez is good. If not, who's left behind them? Well, actually a few guys, believe it or not. Jon Pettibone is at the top of the list after a decent run in 2013. Ethan Martin should be a full-time reliever, but he'd be an option I guess. Adam Morgan is a guy I'm looking for big things from in 2014. Are any of them MLB ready? I'm not sure. Are they at least talented? Yeah. Which takes me to the IronPigs rotation, and what I'm guessing it will look like this year. The IronPigs recently picked up two solid veteran AAA arms that could help. Greg Smith was outstanding for the Pigs in their stretch run, pitching to a 2.68 ERA after being picked up in June. Chris Bootcheck went 10-7 with a 3.69 ERA last season in Scranton. Right now I see Pettibone, Morgan, Smith, and Bootcheck making up 80% of the Pigs rotation in 2014. That leaves one basic debate, one that I would approach with caution- where should Jesse Biddle start. My vote is for Reading, back in AA, because his control issues alarm me. A guy with his caliber of arm should not fear throwing strikes. That just has to stop. 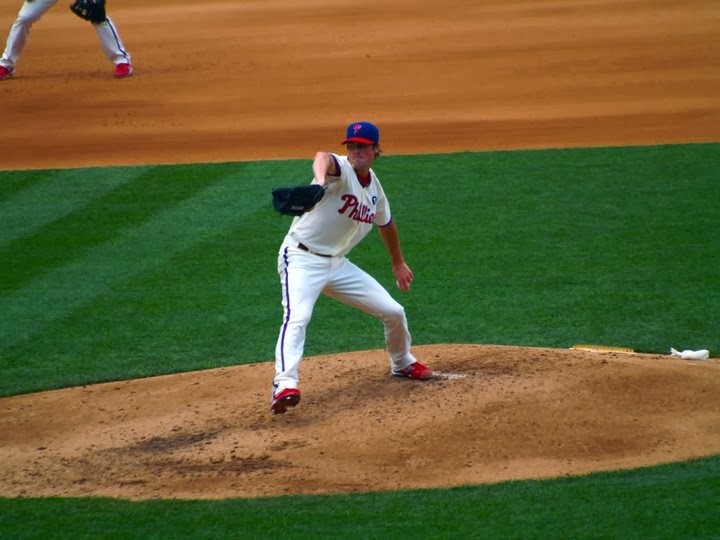 My guess right now is that David Buchanan, who threw well in Allentown, is the front-runner for the #5 job, as is. Don't rule out Cesar Jimenez either, or if any of the Cochran-Miner types out there get invited to camp, they could make it. The Phillies were kept out of the postseason for two seasons in a row, as were their South Philadelphia neighbors, the Eagles. The Eagles tonight pulled off a 24-22 defeat of the Dallas Cowboys in Dallas to secure an NFC East Championship. The Eagles have successfully pulled from worst to first. Maybe the Phillies can rebound this upcoming season as the Eagles have. We have missed the playoffs. Keep an eye on what the Eagles are doing this postseason by following our sister site, Eagledelphia.com on Facebook and on Twitter. Phillies Fans Get Frustrated, But What Exactly Are The Atlanta Braves Doing? The frustration of Phillies fans is well-documented. The Phillies seemed poised to add a big player, but instead they have settled for the likes of Marlon Byrd and Roberto Hernandez. When assessing the Phillies' chances in the National League East, it is hard to feel optimistic. But looking at one team the Phillies face frequently in the National League East, there is reason to feel at least a little bit better. The Atlanta Braves may have done the least of any team out there. The Braves lost their veteran ace of many years, Tim Hudson, and durable starter Paul Maholm. Hudson is no longer ace material, but he was a reliable veteran arm in the starting rotation. Hudson will be replaced internally from among their young pitchers. Veteran starter Paul Maholm is also a free agent, someone who is decent enough and can pitch many innings. Remember, this is the Braves rotation who was forced to start Freddy Garcia in a pivotal elimination game this postseason. The Braves rotation as it stands: Kris Medlen, Julio Teheran, Alex Wood, Mike Minor, and probably Brandon Beachy until Gavin Floyd recovers from his injury. There is plenty of promising youth in the Braves rotation but it could easily go south. Gavin Floyd could be that veteran, stabilizing presence, but the Braves' rotation as it stands right now is very thin. They could still make a trade; David Price is still around. But as of right now, Braves fans know that the starting rotation needs help. At catcher the Braves have three catchers on the roster that will catch in 2014: Evan Gattis, Ryan Doumit, and Gerald Laird. Laird is a solid defender with no bat. Gattis and Doumit have been at different times solid bats with no defense. It seems like the Braves will rely on Gattis and Doumit for offense and Laird for defense when they need it. Gattis ended 2013 as the Braves' starting left fielder and Doumit spent the last few years playing a good amount in the outfield himself while backing up Joe Mauer. The three may do about average for a team looking for a catcher, but the Braves have spoiled fans with seven All-Star seasons from Brian McCann during the last nine years. That is quite a drop off. What to do with Upton and Uggla? The Braves could have given B.J. Upton's money to Brian McCann and retained him. Upton is due $14.45 million in 2014 and Uggla $13 million in 2014. Upton and Uggla were both benched by the latter part of the 2013 season, and Uggla was even left off of the Braves postseason roster. Upton's lack of production in 2013 was made up for by Evan Gattis, who manned left field while Jason Heyward moved to center and Justin Upton to right. With Gattis moving behind the plate, the Braves will once again need to rely on an Upton-Upton-Heyward outfield. The Braves have no clear second base alternative for Dan Uggla. The good news for the Braves is that Upton and Uggla were so bad that they almost have to do better in 2014. Upton only batted .184 and Uggla .179 in 2013. Uggla is battling complications from laser eye surgery and Upton remains a mystery. The Braves cannot afford to cut either; Upton has four more years remaining on his contract and Uggla two. The Braves lineup simply cannot sustain losing McCann and carry both of these players. What Could the Braves Still Do? The biggest surprise could be a trade for a major starter, such as the Rays' David Price. Price is from Murfreesboro, Tennessee, a few hours north and west of Atlanta. Price may be willing to sign a contract extension upon a trade. But for the Braves to acquire Price, they'll probably have to give up one of their young starters such as Kris Medlen or Julio Teheran. Their strategy could be to let the dust clear from free agent signings and sign whoever is left for cheap once the market subsides. I am not sure that this is enough to excite Atlanta Braves fans. So, Phillies fans, you may be unhappy about this offseason so far, but at least you are not a fan of the Atlanta Braves. The Phillies were supposed to be on the big names this offseason. Instead, the Phillies added a 36 year-old journeyman who experienced a one-year rebirth, re-signed some of their own players, and will count on someone for their rotation whose name we are still unsure of. It is hard to definitively say that the Phillies are going to be better in 2014 than they were in 2013. This wasn't the plan all along, was it? The Phillies are targeting big-time free-agent outfielders and baseball people expect them to be in the mix for Jacoby Ellsbury, Shin-Soo Choo, Nelson Cruz, and possibly Curtis Granderson..
Carlos Beltran is yet another outfielder who could interest the Phillies. But, Phillies fans feel tricked rather than treated to talent. So what happened between then and now? The Phillies were simply unprepared for the salaries the players got, after the market adjusted to new revenues. For all the talk about the "big television contract" the Phillies are supposedly prepared to sign soon, other teams have television contracts of their own, signed and sealed already, with the cash in their pockets. When baseball revenues increase, baseball player salaries increase. But, the Phillies' revenues are decreasing. Attendance is down. Phillies fans do not seem as willing to spend good money for a product that is mediocre. The Phillies have responded to that by changing from a team willing to spend up until the luxury tax threshold, to a team that is looking to stay far below it. With a luxury tax threshold of $189 million in 2014, the Phillies will reportedly spend about $165 million. Despite Roy Halladay and his $20 million salary coming off of the books, the Phillies are bargin bin shopping instead of signing or trading for the next Roy Halladay. Phillies fans are responding by buying even fewer tickets. Instead of investing a better product, the Phillies are sort of dumbing down to the level of revenue. The Phillies could strike gold. A productive season from Ryan Howard and Chase Utley continuing his 2013 form along with typical Cliff Lee and Cole Hamels seasons could end up putting the Phillies where they were and overcome some of their holes. But, things could easily go the other way. One thing is clear: the Phillies decided to not be one of the big boys anymore. For a while, it sounded like the stud pitcher from Japan Masahiro Tanaka possibily could stay in Japan, after the new posting rules limit a Japanese team's compensation to $20 million. After seeing players such as Disuke Matsusaka post for $51.1 million and Yu Darvish post for $57 million, the Rakuten Golden Eagles may have been salivating about the haul they would receive for their ace Masahiro Tanaka, who went 24-0 with a 1.27 ERA last season. Rakuten's decision to post Masahiro Tanaka was announced by team president Yozo Tachibana. Under the new system, the maximum bid will be $20 million. All teams who post a bid of $20 million will be able to negotiate with Tanaka. Could the Phillies be interested? I am sure that the Phillies will post the $20 million to see where things go. The Phillies could be at a disadvantage since they have no other Japanese players to help lure Tanaka to the United States. Many teams will post the $20 million maximum bid to be involved in the conversation. Tanaka probably will get seven years and $120 million beyond the $20 million posting fee. Where else can you get a 25 year-old free agent with this kind of talent? If the Phillies are willing to make a long-term investment, recognizing that Tanaka could be part of the next core they rebuild with, it could be worth it. The Phillies were willing to spend big money for Miguel Alfredo Gonzalez before he was signed at a lower rate after the team physical presumably revealed some issues. So who knows; maybe the team will go for Tanaka. If you look at a Ryan Madson baseball card, you'll see that the last pitch he thrown came with the Phillies in 2011. But two full seasons, two teams, and $12 million paid to Madson later, he has still yet to throw a pitch in the major leagues since the Phillies postseason in 2011 thanks to Tommy John surgery and subsequent complications. We knew that Madson was on the comeback trail, but today we saw for the first time that a team had interest in the former Phillies closer. A: Yes, sources tell me they do. In fact, I hear that Madson has some interest in rejoining the Phillies, as well. Obviously, he has missed the last two seasons with elbow problems, but at 33 he might be an excellent low-risk, potential high-reward signing. 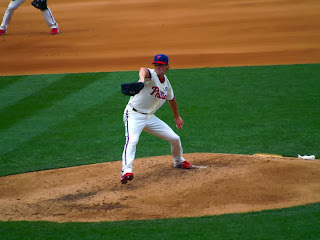 Madson blossomed into one of the best relievers in baseball during his time in Philadelphia -- his emergence was huge in winning the 2008 World Series -- and is familiar with the organization, its leaders, its medical people and many of the players. We hear Madson will audition for clubs early in the New Year and the Phillies will surely keep tabs on him. He’d probably have to take a minor-league deal and prove himself, but a Philadelphia reunion might serve him and the team well. For a team like the Phillies, this would be a low-risk move, provided the deal is a minor league deal. The Phillies know and like Madson. Unlike the Reds and the Angels of Anaheim, who spent millions to get nothing in return, a minor league deal would come with little risk. For Madson, he'll be able to train and rehab in familiar grounds in Clearwater and not have to totally start over somewhere else. Though Madson is from the West Coast, this would be a comfortable opportunity for him. For the Phillies, this could be an offseason where the team takes on many minor league deals in hopes that some of them work out in the Phillies' favor. Madson could do just that. Phillies Legend Harry Kalas Reads, "Twas The Night Before Christmas"
It just would not be Christmas Eve without it. Merry Christmas, everyone. Nick Carfardo of the Boston Globe always seems to come up with league-wide baseball news that nobody else seems to find. Mulder is looking for a creative contract as he makes his comeback attempt. He may have to agree to a minor league deal first, with incentives if he makes the major league club. Mulder has worked out for the Giants, Padres, Diamondbacks, Angels, and Phillies over two sessions. In the second session, Mulder, who hasn’t pitched in the majors since 2008, improved his velocity from 88 to 92 miles per hour. It’s a long road back, but the fact that Mulder’s shoulder is showing no signs of discomfort could mean he’d be a good back-end option for someone. The Red Sox have inquired, but probably won’t pursue him. The velocity is pretty decent for someone who has been out of baseball since 2008. Since the Phillies won the World Series that year, we are all well aware how long ago that was. Another report contradicts Carfardo's report about Mulder being willing to take a minor league contract. The Belleville-News Democrat of Southwestern Illinois reports that Mulder is hoping that someone will give him a guaranteed major league contract, a "somewhat ridiculous" notion for someone who has not pitched in the major leagues in so long. In this offseason of inflated contracts, I suppose it is worth asking for, but a minor league deal with incentives is more likely for Mulder.